Politics • Hatch says temporary action hasn't helped economy. 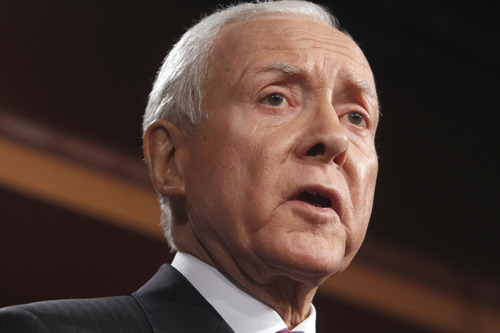 AP file photo Sen. Orrin Hatch, R-Utah, opposes extension of a payroll tax cut. He said Congress should be focused on permanent tax reform. "I cannot support extending tax policies that were intended to be temporary and that have proven to be ineffective at creating jobs or stimulating economic growth," said Hatch, R-Utah. Last year, Congress at the urging of the president temporarily reduced the payroll tax paid by employees from 6.2 percent to 4.2 percent. That reduction expires at the end of the month, and the two parties are trying to reach an agreement on how to fund an extension, and possibly an expansion, of that tax relief. The payroll tax pays for Social Security. Obama and the Democrats want to cut the tax rate to 3.1 percent for workers, while House Speaker John Boehner and Senate Minority Leader Mitch McConnell prefer to keep it at 4.2 percent. On Thursday, the Senate voted on and rejected partisan proposals that would keep the Social Security Trust Fund whole. The Democrats would cover the cost of their $265 billion plan by increasing taxes on millionaires, while Republicans tried a cheaper version funded by freezing federal wages, reducing the federal workforce and making the wealthy pay more for Medicare. Now party leaders are negotiating a compromise that they hope to push through Congress before they break for Christmas. Hatch became disillusioned with trying to stimulate the economy in the short term through the tax code after he joined with Sen. Chuck Schumer, D-N.Y., in 2010 to reduce the employer side of the payroll tax if the company hired someone who had been out of work for more than two months. Hatch was discouraged that the limited program didn't result in much job growth and has decided a better tactic is a broader reform of the tax code. "Instead of a short-term Band-Aid that doesn't help the unemployed, a better approach would be to fundamentally overhaul and restructure our tax code to permanently lower people's tax rates," he said. For years, congressional leaders have talked about a broad tax reform, but no major proposal is in the offing. While Hatch doesn't like the idea of extending the payroll tax holiday, which for the average family equates to about $1,000 in a year, he did like McConnell's proposal to pay for it. But he would like to use the money created by shrinking the federal workforce and having the wealthy pay higher Medicare premiums to reduce the nation's debt. President Barack Obama has made the payroll tax cut extension a priority, warning that if Congress doesn't act before the holiday recess, "we can all spend Christmas here together." Republican leaders in the GOP-controlled House and the Senate, controlled by Democrats, say some version of the tax cut extension will pass. Republicans fear the political fallout if the break expires Jan. 1 and taxes go up on 160 million wage-earners.